An unforgettable Flamenco Guitar Album that brings new Passion, Power and Excitement to this incredible Spanish art. Perfect CD to drive to. Features songs heard on the hit TV Shows: "Kyle xy" & "Greek". "If you are familiar with my past work...namely, 'Motivación', you are in for a surprise. It will be obvious after just one listen through that I have grown enormously in my musical art. If you are a new friend I encourage you to give 'Motivación' a listen, you will not regret it. Not only will you have some more great tunes to listen to, but you will also be able to fully appreciate how much I have grown as a musician and producer to be able to create this project. You will find so much in this CD. Treat yourself to a set of headphones to enjoy this CD with. There will be songs that you love right away, others might grow on you...and still others might grab you when you least expect. Be prepared for anything because I didn't hold back! Whatever I thought up is represented here, from udus and zarbs, to electric guitars and duets. All of it is honest and true to my heart...I am now ready for it to speak to your heart. A truly organized menagerie; soothes and excites the soul!!!! The CD portrays a broad range of flamenco; exciting and passionate; it touches one's spirit, highly energetic and fluid; makes me want to dance (I am taking flamenco dance lessons....) Excellent! This CD rocks!! It's a nice compilation of tunes. This CD rocks!! It's a nice compilation of tunes. They flow into each other creating a beautiful mood. Very pleasing to the soul. Very sensuous. Flamenco is an awesome combination of cultures. Chris demonstrates the richness of this musical form through his wonderful talent. I listen to this CD over and over and over again. It's great!!! Flamenco fans will enjoy this one. Very nice disk - there's only one or two song on the CD that I don't like. C. Burton isn't just writting his own version of classical guitar or flamenco ; you can hear those two very strong influences, but it is definitely modern and original. This CD is one of my all time favorites. I love the Middle Eastern undertones in many of the songs. The Kiss is especially meaningful as after hearing it, I was lucky enough to be able to get Chris Burton Jacome to play that song as the processional music in my wedding. It moved everyone. The entire CD is full of soulful, soothing, and inspirational music. I highly recommend this CD! 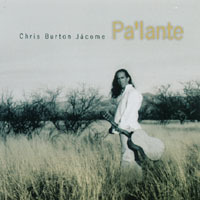 If you even mildly enjoy flamenco guitar, this CD is a MUST for your collection. Chris is becoming one of the new masters, and his compas is completely on the mark. I'd give this one 10 stars if I could. OLE!